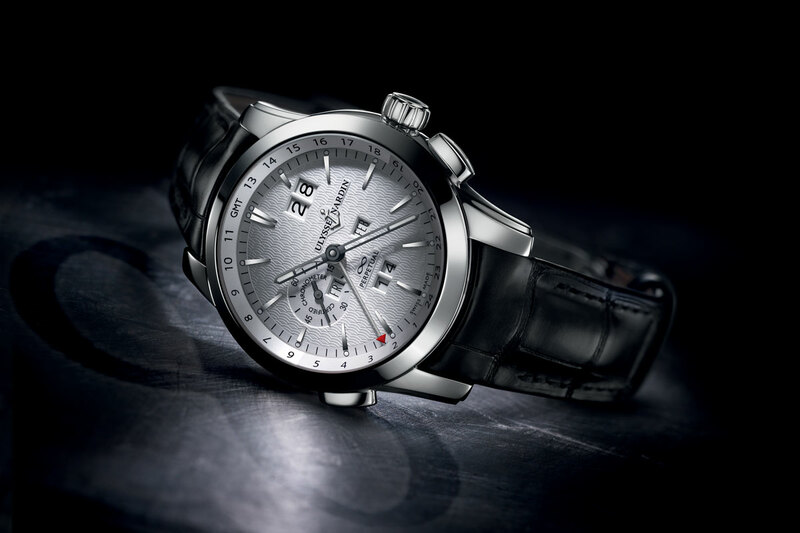 The beautiful and vintage-inspired Montblanc Heritage collection inaugurates MB's new QP movement. 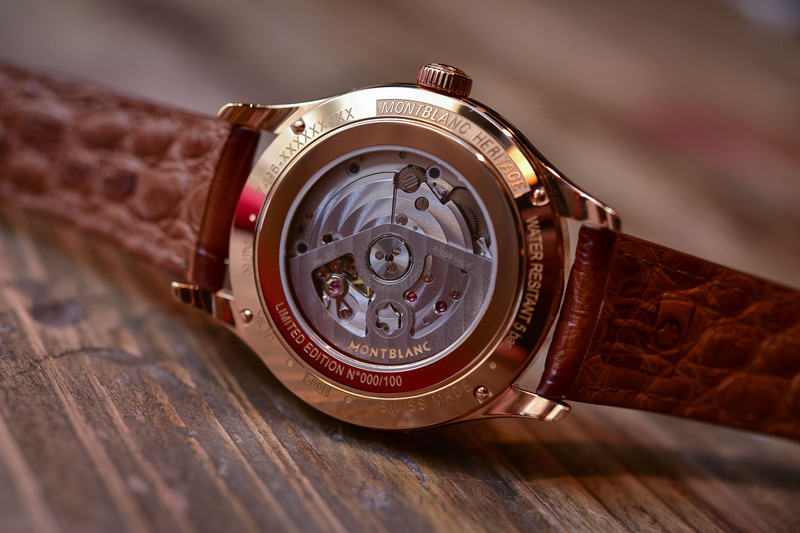 For the SIHH 2019, Montblanc introduces a completely revamped “Heritage” collection. Hardly a newcomer, the Heritage collection already houses models such as the Heritage Spirit Pulsograph or the Heritage Perpetual Calendar. The latter became the talking piece at the SIHH 2014, positioning itself at that time as the most affordable QP on the market. 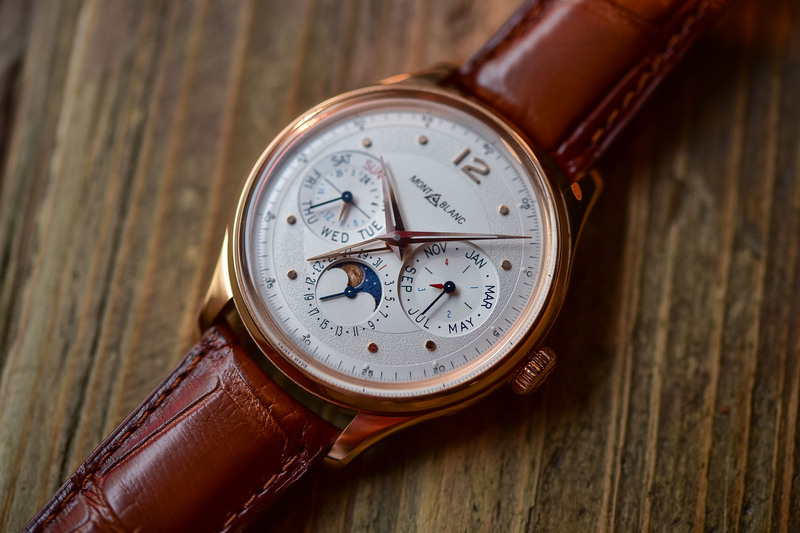 Having a redesigned collection is one thing, but Montblanc has decided to give this watch something extra: the brand’s first manufacture perpetual calendar movement. 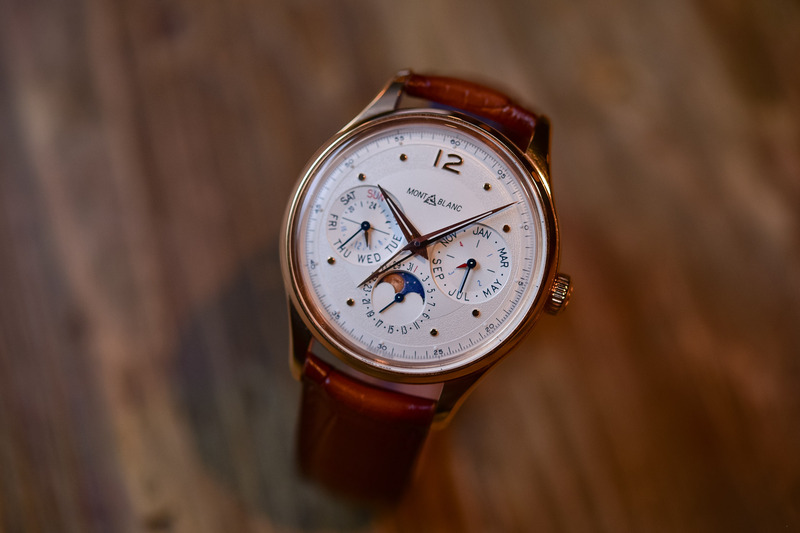 Meet the new Montblanc Heritage Manufacture Perpetual Calendar LE100. No debate… the design of the new Montblanc Heritage is vintage to the core. By looking at the rich Minerva archives (Minerva is now owned by MB), the brand resurrects some of the glorious design elements found on these watches. Restrained proportions, elegant shapes, domed dials, two-tone colour schemes, applied dots and numerals, retro-styled hands… Everything recalls 1940s and 1950s Minerva watches – especially on the Pulsograph version that we’ll cover during the SIHH 2019. The case is elegant and discreet with a 40mm diameter. It reveals a thin bezel and nicely curved case bands. The lugs are tapered and short, making this watch compact on the wrist. Dressy without being too formal, vintage without being outdated. 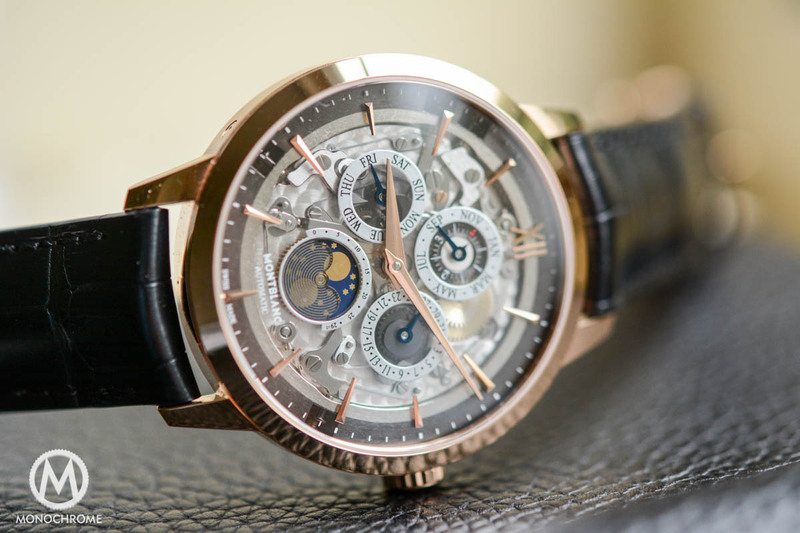 For the inaugural (and limited) version, the case is crafted in 18k pink gold – a steel version, of course with a lower price, will also be available. Complementing the look is the vintage Montblanc signature and a very nice Sfumato alligator leather strap – here in a gradient brown version, attached to a classic pin buckle. 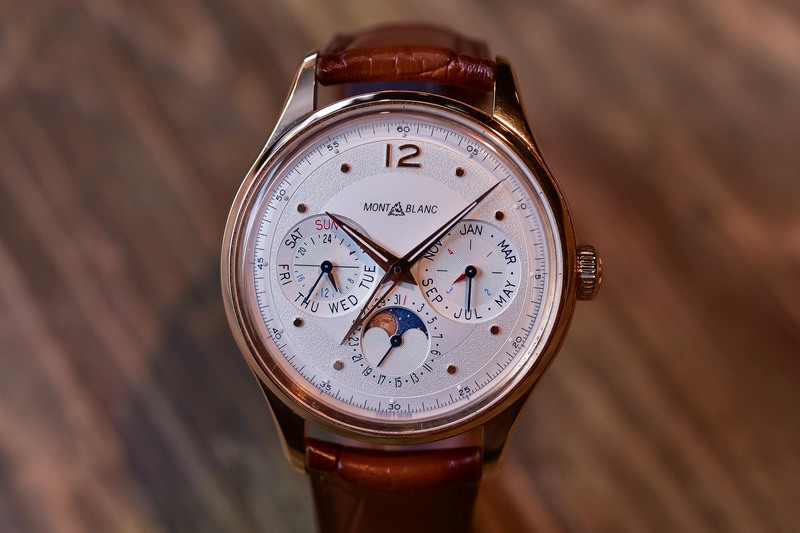 The dial is the main interest of this Montblanc Heritage Manufacture Perpetual Calendar LE100. As for the rest of this new Heritage collection, great work has been done to give it elegance, classic appeal and luxurious details. Relying on the 1940s Minerva codes (for elegant watches, not military/pilot watches), the dial is silvered with a two-tone colour scheme and features several sectors with different textures. 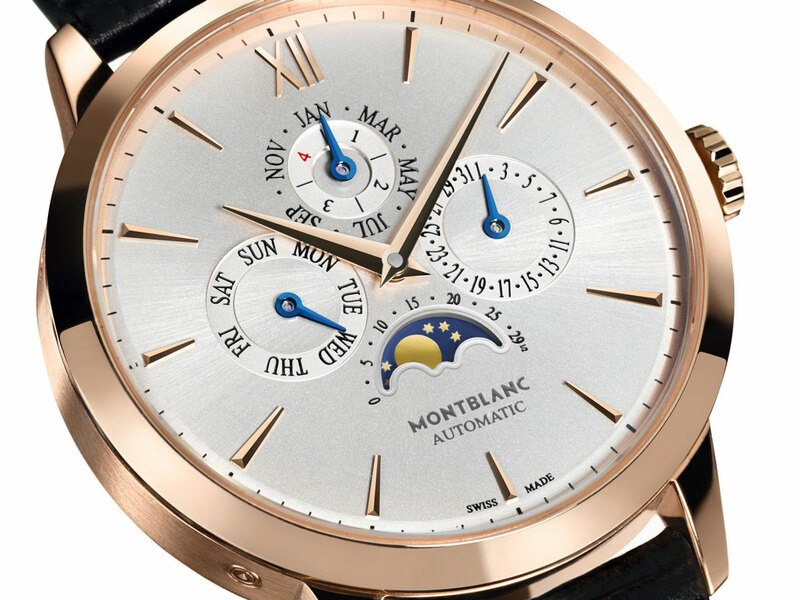 The centre and minute tracks are opaline while the hour track is grained, which in turn features applied gold dots and Arabic numerals – again a typically Minerva style. Also, the dial is emphatically domed – something clearly visible around the sub-counters. 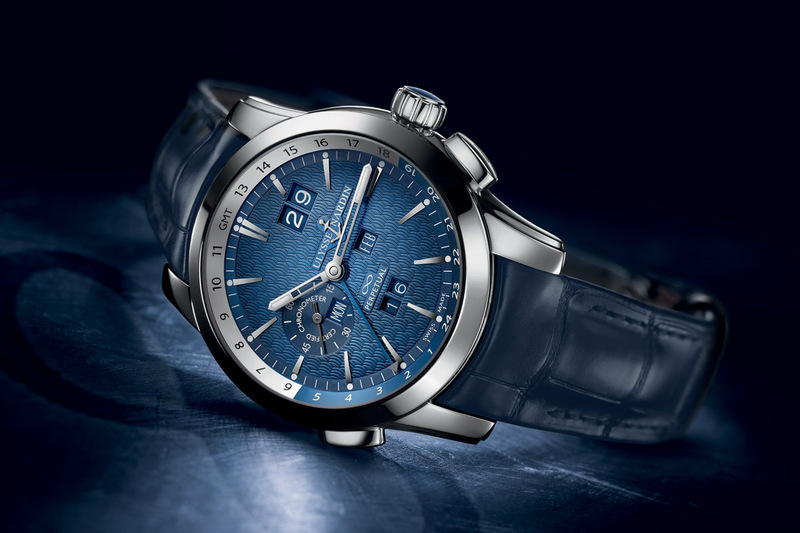 Add to that a box-shaped sapphire crystal and you have a watch that recalls the past. The lance-shaped hands are also in line with Minerva styling. 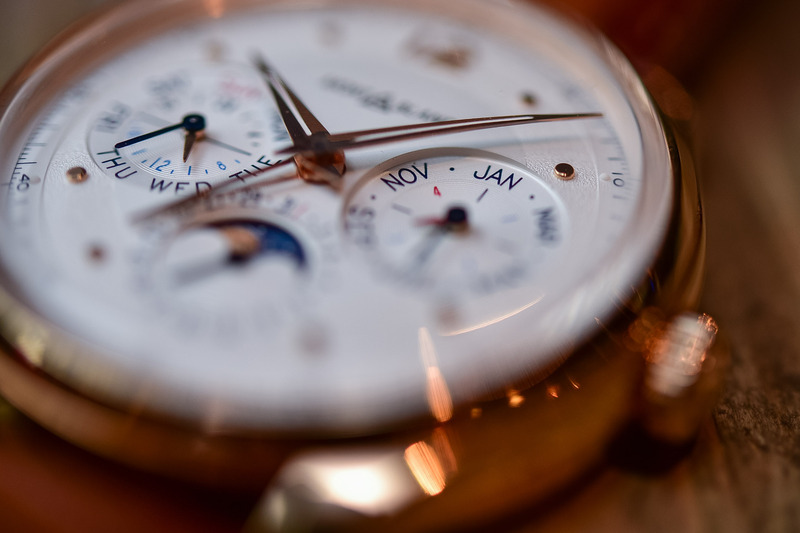 As for the display, Montblanc paid heed to the criticism levelled on its Heritage Perpetual Calendar. Because this watch was powered by a Sellita movement with a Dubois Depraz module on top (mechanics developed during the 1990s, when watches were 35mm), the dial looked quite empty, with sub-counters right in the middle. Thanks to a new module, the Montblanc Heritage Manufacture Perpetual Calendar now has a balanced dial with well-proportioned sub-counters. 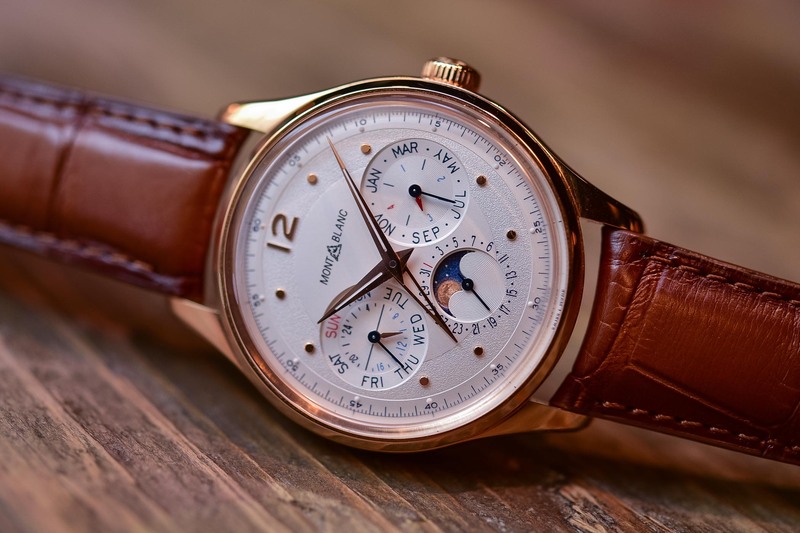 The dial indicates the hours and minutes in the centre, a second time zone and all the required indications for a perpetual calendar: day, date, month, leap year and moon phase. All are placed in a classical way but remain legible and balanced. The second main update, especially on this model, is the introduction of a “manufacture” movement – a word that needs to be explained. Entry-level watches in the Heritage collection will be powered by Sellita engines and chronographs by specifically developed calibres. 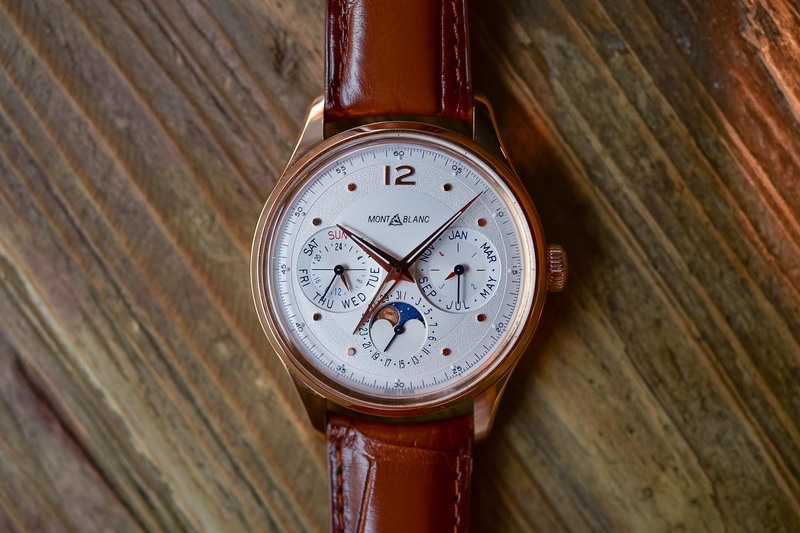 With the perpetual calendar model, Montblanc inaugurates new mechanics. When the brand says “Manufacture”, it means a movement that is proprietary but not per se “in-house”. 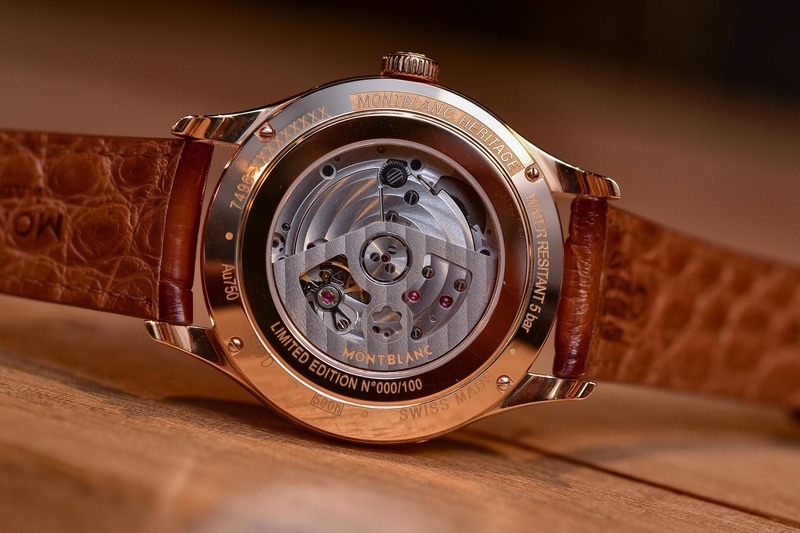 The calibre MB 29.22 of this watch is based on a 3-hand movement, designed for Montblanc and assembled at Val-Fleurier (shared production facilities of Richemont). On top is a custom-built perpetual calendar module, specific to Montblanc. The base movement is automatic with a central rotor and delivers 48 hours of power reserve to the watch, with a 4Hz frequency. Besides its multiple indications, the QP module also features interesting specifications, such as a bi-directional setting capacity, thanks to a wheel-only construction (no cams). This means that the date can be corrected both forwards and backwards. The movement is visible through a sapphire caseback and is decorated in a nice, discreet way. It is certified by the MB 500-hour test procedure. 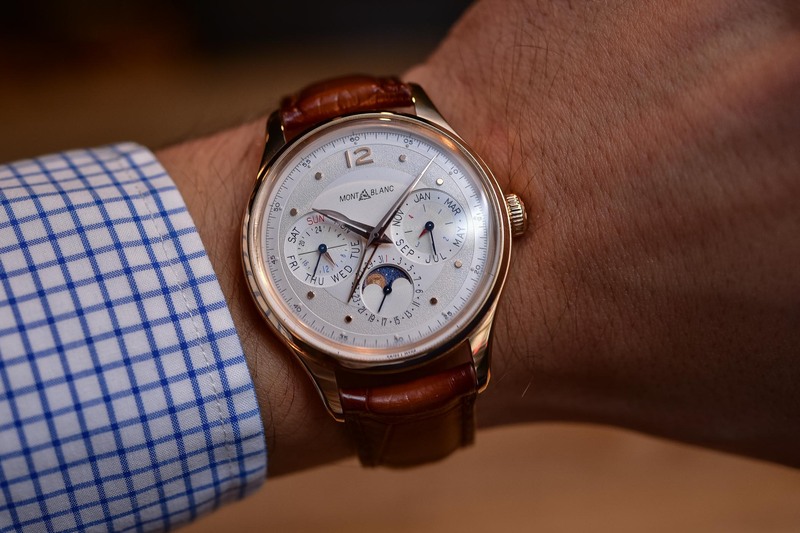 The Montblanc Heritage Manufacture Perpetual Calendar LE100 will be produced in 100 pieces, priced at EUR 25,000. Deliveries are expected in September 2019. More Heritage models will be introduced during SIHH 2019, including chronographs, time-only, day-date and GMT models. Not sure if I would define 40 mm a “restrained” size!